English Premier League club Liverpool which is also one of the Big Four club as well made a dramatically draw against Spanish club Sevilla. In the first half, Brazilian Roberto Firmino and Sadio Mane showed amazing skills. Both of them scored total three goals where Roberto Firmino scored twice and Sadio Mane scored one goal. They took control of the match in the first half. But in the second half, Spanish Sevilla turned around and repaid all three goals. So, Liverpool made a draw with Sevilla by 3 – 3 at the end. At the end, the match between Liverpool and Sevilla finished with 3 – 3 draw and so, the waiting session to qualify for the knockout stage of Champions League has just delayed. The Reds have to wait some more to get qualify. However, they have played five group stage matches where managed victory twice and made three draw. With 9 points, the Reds is in top position in group E point table. Sevilla is in 2nd position with 8 points. In other match of group E, Maribor made a draw with Spartak Moskva by 1 – 1. So, with 6 points, Spartak Moskva is in 3rd position on the group table. All three teams has the possibility to go to the knockout phase. Russian club Spartak Moskva will play the last match against Liverpool and Sevilla will play the match against the lower ranked team Maribor at last. 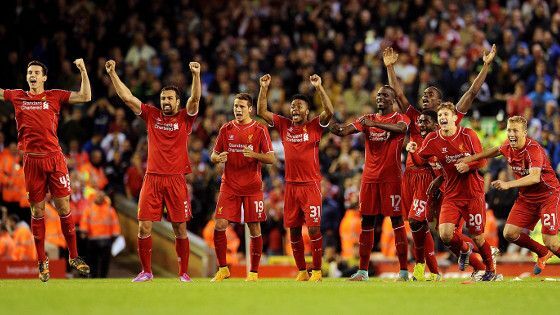 At the opponent’s home ground in last tuesday night, in second minutes Liverpool went ahead. Brazilian star Philippe Coutinho made a corner shot and Wijnaldum made a flick, So, the ball passed to other Brazilian star Firmino in a blank spot. He easily made his mark to the goal post. In 22nd minutes of the game, Sadio Mane made the difference double. Coutinho made a corner and Firmino touched the ball with his head but with the diving head, this Senegal forward Mane made the goal successfully. In 30th minutes of the game, from the left side Liverpool made the attack but opponent stopper rejected the ball but could not make the ball danger free. In return shot Firmino made the scoreline 3 – 0. 1st half finished with 3 – 0. And by then it seemed that the Reds were going to win the match. But in 51st minutes, Sevilla turned around and got the first goal. Just nine minutes after, through a spot kick, they made the scoreline 3 – 2. In additional minutes, they scored the 3rd goals and the hope of Liverpool went end.